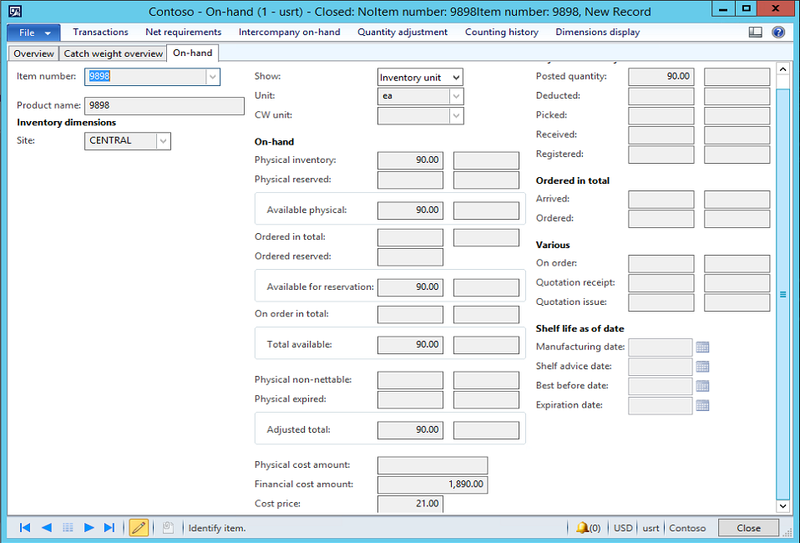 Overview: Vendor Price Protection is a topic Microsoft Dynamics AX 2012 Retail Customers often ask the best practice method using standard AX processes. Vendor Price Protections are agreements between the vendor and customer where in the event the on-hand inventory is devalued, the vendor will reimburse the customer for the loss of value. This is also referred to as a Funded Markdown. Inventory devaluation may occur for a number of reasons. One example would be, the new xPhone 7 is released today, which instantly reduces the value of any on-hand xPhone 6s. Another example would be inventory that did not sell as well as expected, which over time will hold a lower value than the original cost. The first step is to provide the vendor a report of the on-hand inventory for the given item(s). The vendor or customer will calculate the adjustment total and generally take this amount as a vendor credit. 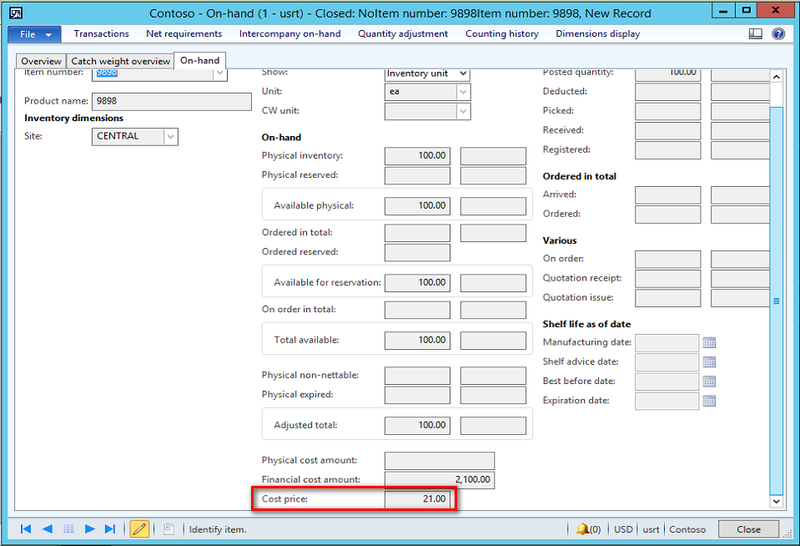 In the AX 2012 product, the Moving Average costing method is the best to accommodate the required transactions. The process is outlined simply as: Record Vendor Credit, CR to account defined as ‘Cost Revaluation for Moving average’ in Posting Profile. And adjust on-hand value of inventory, resulting in an automatic DR entry to ‘Cost Revaluation for Moving average’. The result is a reduced inventory valuation by means of a vendor credit. An example of the end-to-end process for applying a Vendor Price Protection adjustment follows. 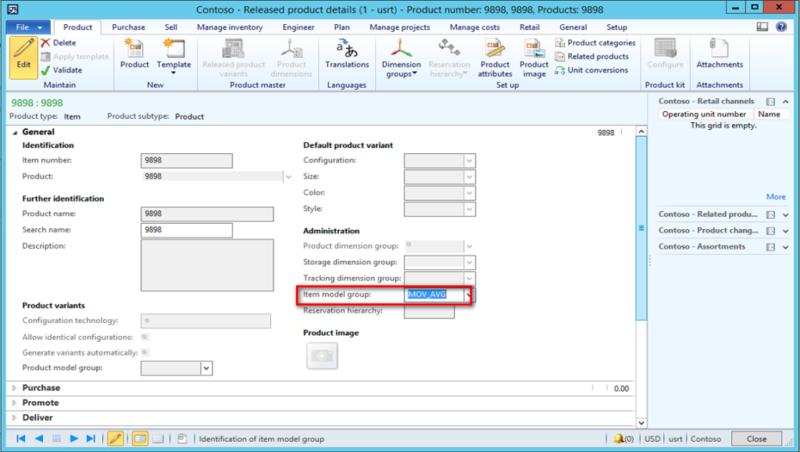 Select the Item Model Group that has Moving Average defined as the costing method. Next, we’ll enter a Purchase Order for 100 units @ $20. Additionally, we’ll allocate $100 in freight to the lines. Freight entered and allocated to the line. The Purchase Order is received and invoiced. By viewing the On-Hand details for Item #9898 we can see that the inventory value (cost price) is $21 each. We’ll now sell 10 of the items at $59.99. By viewing the on-hand details, we can see our remaining physical inventory is 90 units at a value of $21 each. Before we proceed with making the adjustment, let’s review Item Posting. Navigate to Inventory management > Setup > Posting > Posting). 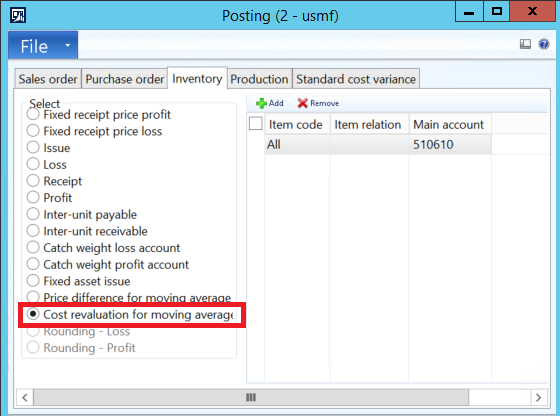 The Cost revaluation for moving average account will define the posting for any adjustments to the value of inventory. Notice the account defined as 510610. Item 9898 has not been selling well. We have a Price Protection Agreement with the Vendor. The vendor has been notified of our on hand inventory is 90 units at $21. The terms of our agreement allow a $10 credit per unit on hand. The vendor has approved the credit of (90 units @ $10) = $900. First we’ll record the vendor credit by entering an AP Invoice Journal. The vendor credit should be posted to account 510610. The resulting entry will post a CR to 510610. Next, we need to post the adjustment to the inventory value. Navigate to Inventory management > Periodic > Revaluation for moving average. 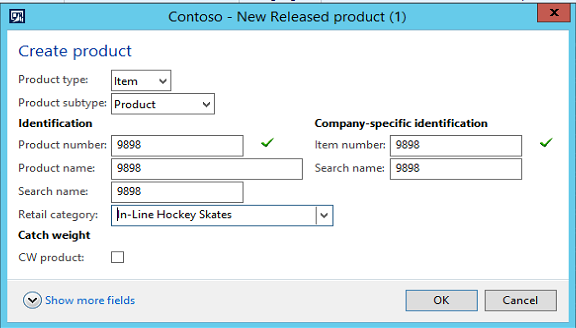 Use the Select criteria to choose the item number and site. Enter the new unit cost of $11.00. The resulting entry will display in the Edit now field. 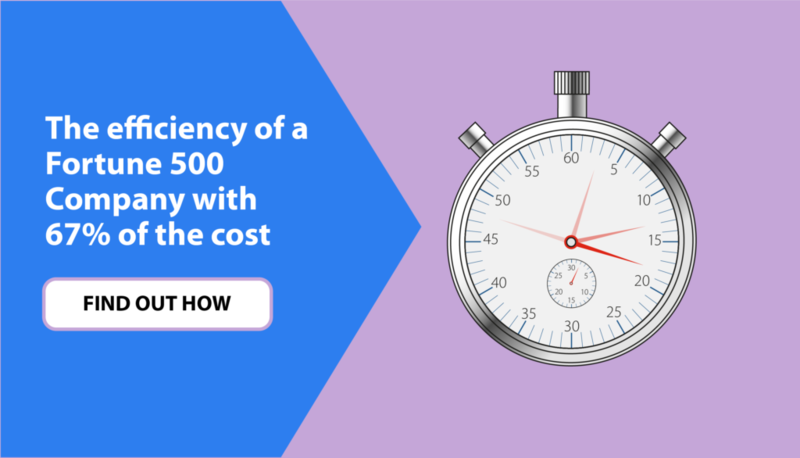 Post the adjustment which will result in an automatic DR entry to 510610. The net effect in account 510610 will be zero. We can confirm this entry by navigating to the GL account. In summary, we have demonstrated in AX 2012 how to process a Vendor Price Protection adjustment using the Moving Average inventory costing method. For more information on this topic, a free whitepaper from Microsoft is available here for download. To stay In The Know connect with us via social media, or check out more posts on our blog.